There are NO gimmicks, complicated memberships, pre-purchased packages, sign-ups, penalties or fine print. Just quality yoga classes at your convenience. Our teachers have over 50 years combined teaching experience so you’re quite literally in great hands. Our diverse community is made up of men and women of all ages and fitness levels. Every body is different and our goal is simply to bring out the best in yours. We are proud to celebrate over 13 years in Downtown Spartanburg! In an effort to keep up with these times of advancing technology, we are turning to social media to keep you posted of our schedule and special events and will no longer send out a monthly newsletter. Check our website often and/or like us on Facebook, or follow us on Twitter @YogaliciousYogi or @catquerin and on Instagram @yogalicioussc. This heart-centered practice infuses breath with optimal alignment to maximize energy and empower your practice. Build strength and endurance with a deep, yet playful approach that promotes body awareness and reveals an expansive nature. This class is appropriate for all levels. Too often we move through our days with the sole purpose of checking things off our “to-do” list. This class invites you to step into the flow of moment-to-moment awareness. By savoring the present we enter fully into our nature – a place of love, peace and contentment. Suitable for experienced beginners to intermediate students. Teaches the basic principles of yoga, alignment and breathing. Ideal for students new to yoga for building a solid foundation; beneficial for all yoga practitioners. Push the pause button on your midweek to-do list for this slower type of flow (vinyasa) yoga practice. Strength, alignment and flexibility are achieved by moving intentionally through and holding poses for multiple breaths. Experience improved muscle stamina and concentration, as well as what letting go of tension and anxiety feels like. Leave class feeling calm, yet challenged and energized by this practice. Ideal for all levels of practice. A lovely morning vinyasa flow with an emphasis on yin yoga toward the end of class. Come warm up with Kimberlie on Tuesday and Thursday mornings! 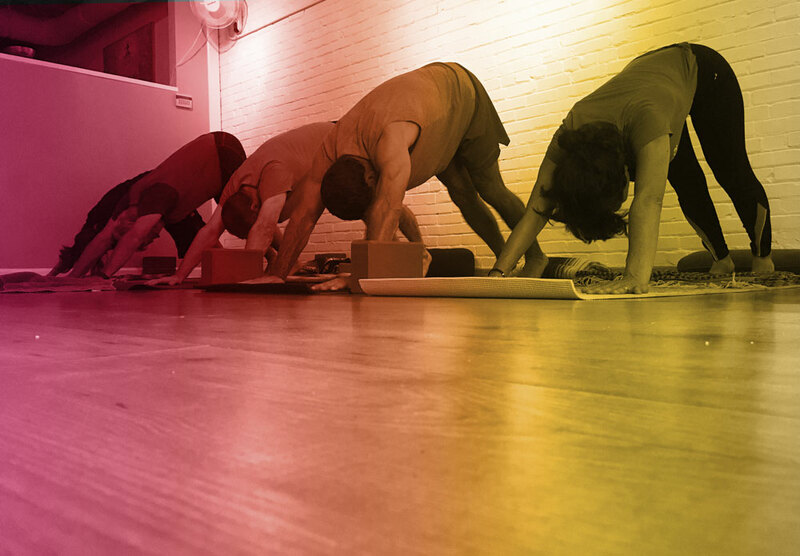 This class is intended for the beginner as well as the seasoned yoga practitioner. Based on the Ashtanga series developed by Sri K. Pattabhi Jois, this vigorous class will follow the signature technique of linking breath and movement, but with more varied and eclectic sequencing. We will work through some of the primary series poses while offering a fusion of ideas and asanas. Modifications of poses will be shown for all ability levels. Ideal for experienced beginners, intermediate and advanced practitioners. Explore the basic principles of yoga, including asana (the poses) with gentle and restorative options and techniques for self-care and healing. Ideal for beginners and those who want to start the weekend feeling their best. A practice where breath and movement are harmonized into an energetic and dynamic heat-building practice. Sun salutations are a regular warm up followed by a wide variety of poses to increase strength, flexibility, and balance. Yoga philosophy, meditation and breathing exercises (pranayama) round out this class. Appropriate for advanced beginners to intermediate students. Autoimmune warriors unite! Did you know a yoga practice can help reduce the body’s stress response, calming the mind and body in order for better healing and recovery from the autoimmune response to occur? We’ll practice asana (yoga poses), breath work, meditation and journaling together while discussing techniques, suggestions and dietary recommendations found in Aimee E. Raupp’s book “Body Belief.” Then we’ll share what practices may bring us to our healthiest possible selves. Meet-up is by donation ($10 suggested). Join us every second Saturday of the month for an all-levels yoga practice - only $5! Based on the Ashtanga series developed by Sri K. Pattabhi Jois, this vigorous class will follow the signature technique of linking breath and movement, but with more varied and eclectic sequencing. We will work through some of the primary series poses while offering a fusion of ideas and asanas. Modifications of poses will be shown for all ability levels. *Please note this Sunday practice is 2 hours. Drop-ins (single visit) are $15 or 1 punch on a punch card. 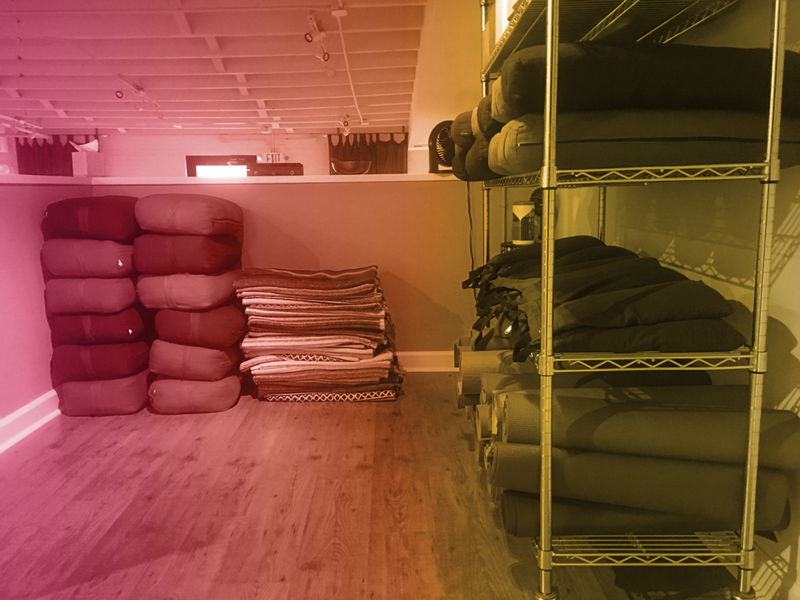 Spend your Sunday afternoon experiencing the deep relaxation and stretching benefits that Restorative Yoga offers. Ideal for all levels of yoga practitioner. All of our teachers are experienced, insured and Yoga Alliance certified. I first practiced yoga while a student at Converse College, with Jan LeFrancois, a psychology professor and certified Iyengar instructor. The peace and focus I found after that first practice was immense. When I returned to Spartanburg in 2004, I found YOGAlicious and experienced my first yoga studio. Studying under Monica, Catherine and Adrienne has been a wondrous, life-altering experience. So much so that I signed up for the very first Teacher Training class at YOGAlicious! When not practicing or teaching yoga, I enjoy the beautiful Upstate, walking my dogs, sipping tea, dancing with our daughter and cooking healthy meals for my family and friends. I have been teaching yoga for over a decade. My inspiration to teach came when my first beloved yoga teacher (Catherine) asked me to substitute one night. I haven't looked back since. I completed my first teacher training at the Asheville Yoga Center with Stephanie Keach. Since then I've been fortunate to have studied with Stacey Millner-Collins, Kelley Gardner, Sarah Faircloth and Martin Kirk. My emphasis is the process of taking lessons learned on the mat into our everyday lives - where real yoga takes place. My hope is to inspire everyone to bring the very best of themselves into the world. I am a Spartanburg native. I began my foray into the fitness world at age nineteen when I became a certified personal trainer. I completed a Yoga Alliance 200-Hour Teacher Training in 1999, an Advanced Teacher Training and also Vinyasa Teacher Training at the Asheville Yoga Center. I have since studied with Rod Stryker, Doug Swenson, Stacey Milner-Collins, Sarah Faircloth, Kelley Gardner, Betsey Downing, Bill Mahony, Douglas Brooks, Scott Blossom, Stephanie and Michael Johnson, and Ana Forrest. I am also a certified Thai Yoga Massage Therapist and a Y12SR Leader. Y12SR is a 12-step based yoga class to help people struggling with addictions. I am thankful for all of my teachers throughout the years, on the mat and off the mat. My greatest teachers are my family: my husband Steve, my daughter Grace, my son Nicholas and my dogs Daisy and Ziggy and Buster. Yoga to me is playful and fun and my intention for each class is for my students to walk out with a smile on their face. I took my first yoga class at the Winston-Salem YMCA from a gentle giant named Wes East, who ignited a passion for yoga that has propelled me since. After completing the 200-hour Teacher Training program at the Asheville Yoga Center, I founded the Blue Ewe Yoga Studio in 2007 in Spencer, NC, I have trained with a variety of gifted teachers, including American Ashtanga pioneer David Williams. 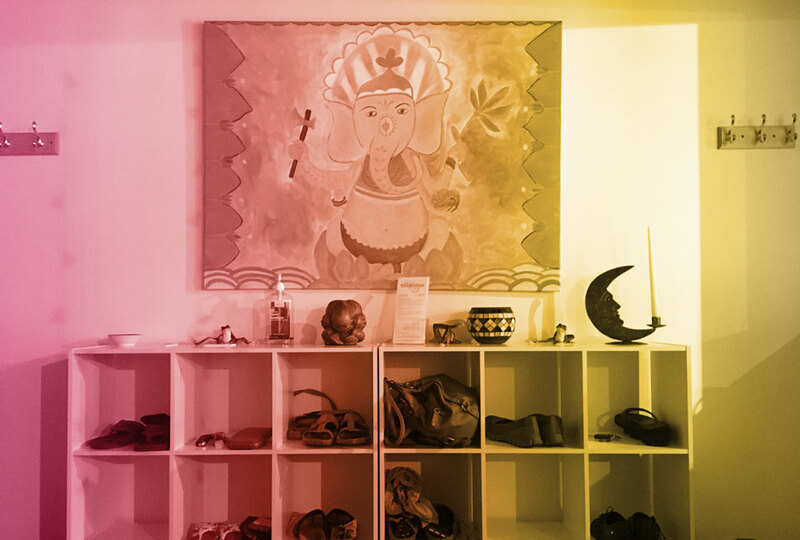 I enjoy teaching a strong vinyasa flow practice, as well as a gentle alignment based, Thai Massage-inspired practice. A self-proclaimed inversion junkie, I seek to help students find balance and flexibility on the mat, which they can incorporate into their daily lives. I recently moved to Spartanburg with my husband Andrew, son Eli, and pets Sally and Rose. Jane began teaching at Yogalicious in 2018, focusing primarily on gentle and restorative practice. After practicing yoga for a few years, she decided when she turned 50 (and when her favorite practice guide took sabbatical to care for her baby) that perhaps it was time SHE took things to the next level and learn to teach yoga - so she did (through Lifestyle & Movement/Lisa Muehlenbien)! She is enjoying this aspect of her practice, and loves guiding others in their own. When she isn't at Yogalicious, Jane can be found at home in Lyman with her husband, Donnie and their three dogs (Elam and Ollie the dachshunds, and Béla the basset hound), offering support to her friends with DRNA rescuing dachshunds, or enjoying downtime with friends and family whether in Spartanburg or in Tennessee, from which she hails. A creative, whimsical artist and kid at heart, she makes a living as a graphic designer at Spartanburg Community College managing all things creative and web for the marketing and PR department. Join Yoga Jane for some relaxing, yet empowering asana at Yogalicious. Brian lives and works to embody simple and effective asana, pranayama and meditation practices which enhance physical, mental and spiritual health and lead to a deep and authentic connection with self and source. A Yoga Alliance registered RYT500 Certified Yoga Teacher, and a Y12SR Certified Space Holder and Brandywine (DE) YMCA Certified Yoga Intensive Teacher, Brian’s focus is on the healing power of Yoga for ALL, with an aim to broadening accessibility to under-served communities and deepening availability to those who are suffering in any area of life. Brian has trained for Yoga Teaching with Rolf Gates, Nikki Myers, Tommy Rosen, Christine Shaw, Erin Detwiller-Sweeney and Susan Smith. Brian has indirectly studied with Leslie Kaminoff, Seane Corn, Rodney Yee, Beryl Bender-Smith and Sadie Nardini. I grew up on Long Island, New York and I came to Spartanburg earlier this year as anArtist in Residence with the Chapman Cultural Center. I am primarily a painter but, like everything else, I believe I learn the most when I am exploring across media – from video, to performance, to printmaking. I began practicing yoga regularly after I graduated from college in 2013, a time in which I was eager to embrace the opportunity to connect with my own body and other yogis after long days alone in studio. I believe that art and yoga are complimentary disciplines and I am constantly drawn to the infinite intricacies yet simultaneous simplicities of yoga. I believe that the practice of yoga and meditation, with careful attention to alignment and breath, increases strength and flexibility not just physically, but also helps to balance and connect the physical body to mind and soul. I strive for my teaching style to be both thoughtful and accessible to all levels, rooted in the belief that a balanced practice can only be built through openness, consistency, and patience. I received my RYT-200 certification in 2016 from Jared McCann at the Lighthouse Yoga School in Brooklyn, NY. With the belief that a great teacher is always first and foremost a student, I continue to practice daily and study with my mentors. I am especially drawn to the Ashtanga yoga practice for its structure and ritual as well as its openness to exploration. When I am not practicing yoga, you can find me snuggling with my pit bull, Stacks, exploring the outdoors, basking in the sun, spending time with my family, or cooking a good meal with friends. I am very excited to share my love of yoga with the Yogalicious community! Please contact us if you have any additional questions or concerns.